ProMission Projects in Idaho is a great example of an MSP with the best interest of their clients in mind. When a client refused to upgrade their aging server farm, ProMission convinced them to put a Datto SIRIS in place, knowing they’d need a robust backup and disaster recovery solution in place when the servers crashed. 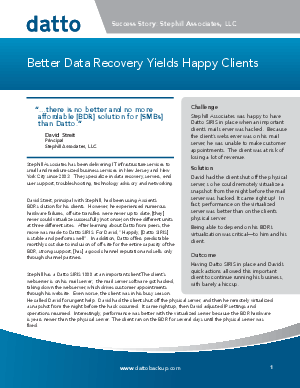 The servers did indeed crash, and ProMission and Datto were able to keep the business running. ProMission foresight made for a very happy and thankful client. Read the story.